Rodna Mountains National Park was established in 1932 by the Council of Ministres Journal no. 1949/1932, confirmed by Law no. 137/1995 and Law no. 5/2000 is a protected area of national and international interest, being included in the IUCN classified as a Category II-National Park- Biosphere Reserve. Rodna Mountains National Park is the second national park in the country, with an area 47.177 ha, of which 3.300 hectares were declared to be a Biosphere Reserve in 1979. The importance of this protected area's geology and geomorphology is due to both the mountains and the presence of numerous species of flora and fauna, endemic and relict glacial. Most of localities surrounding the park have been testified long time ago, during 13th, 14th and 15th centuries: Rodna, Borsa, Moisei, Nasaud, Rebra and many others. Two important ethnographic areas are to be found: Maramures in the north and Nasaud in the south. The former one shows of numerous architectonical items, such as wood churches (some very old), sculptured porches and traditional houses. In south there are some mineral springs and a health resort (Singeorz-Bai). Starting on 19 November 2014, took APNMR administration of the Community importance site ROSCI0125 Rodna Mountains (area ROSCI0125 Rodna is 47.948 ha, 771 ha exceeds an area PNMR) and ROSPA0085 Rodna Mountains (area Rodna ROSPA0085 is 54.812 ha, which exceeds an area of 7635 ha PNMR). 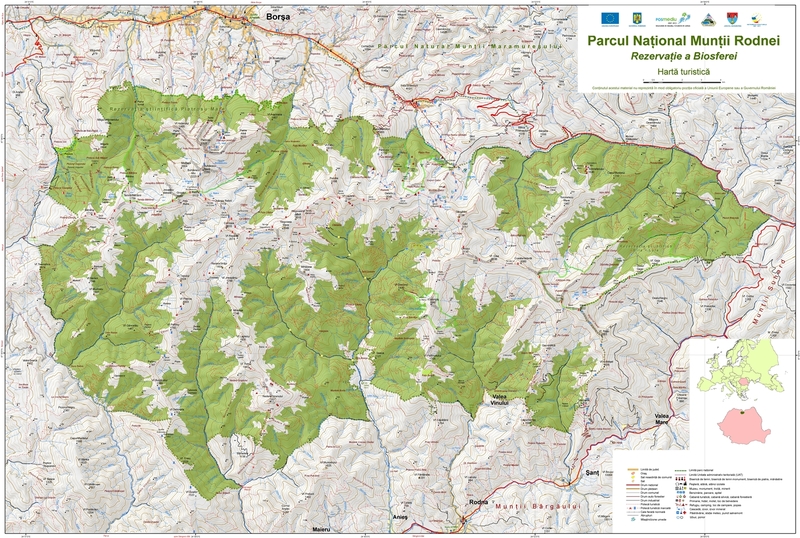 PNMR is an important protected area, contributing to biodiversity conservation Carpathian chain, priceless treasure, European and global level, a fact underlined by the Carpathian Convention to which Romania is a member state. The agreement signed in 2007 is a partnership between seven Carpathian countries: Czech Republic, Poland, Romania, Serbia, Slovakia,Ukraine and Hungary and promotes collaboration between governmental and nongovernmental organizations, specialized institutes, policy makers, specialized organizations, experts and donors International order to protect the unique biodiversity of the Carpathians and facilitate sustainable development in the area. Romania's representative is the chairman of the Carpathian Convention, elected for a term of 4 years.